Last week I started to add the handwritten notes in the 'Office Copy' of the 1918 Absent Voters' List for Barnsley to the transcription of the 6127 names which has been completed by 10 volunteers working under the Barnsley War Memorials Project banner. I had intended to start this the week before, unfortunately, as frequently happens to me I am afraid, I was too ill to leave my bed, let alone travel to Barnsley Archives for a morning's research. I did try to send my apologies via email and Facebook but I don't think any of the ladies gathered at the Archives checked those facilities during the morning, so I am sorry if I let anyone down. The past two weeks have been eventful and so each of my sessions on this new sub-project have been shortened from my usual 10am to 1pm. However I have managed to transcribe 9 pages of the handwritten notes so far, each page containing 45 to 50 names. There are 132 pages in the whole book so at this rate it is going to take me about 30 weeks to complete the task. I am sure that it will take longer, as other more urgent problems and queries are bound to crop up over the next few months. Unfortunately as the handwritten notes are on a facing page to the typed information which we have already transcribed - and the typed pages also contain amendments written in red ink which I am also noting - it seems unlikely that we would be able to photograph the full two page spread in sufficient detail to enable other home-based volunteers to assist in this. However if anyone wants to have a go in the Archives (just not on a Thursday morning please!) please do, I would be happy to work out some system whereby we can do this co-operatively. A long time ago, October 2012 according to the create date on the appropriate spreadsheet, I started looking at Prisoners of War from Barnsley in the First World War and in June 2013 I did a quick survey of the Absent Voters' List recording the men listed as 'Pris of War' etc in the handwritten notes. I found 141 names, with the usual details of rank, regiment and service number. I now realise that a few of these are actually guards at Prisoner of War camps - not prisoners themselves! My only excuse for this is that notes are quite brief, usually abbrieviated so it takes a little while (and some cross checking) to work out what they actually mean in a number of cases. In the course of that survey I discovered that the handwritten notes do NOT cover the whole book, there are 14 blank pages in three distinct chunks. So that reduces the total amount of pages I have to transcribe to 118 and saves me a couple of weeks' work - but such a shame that the document is not complete for those 45(ish) x 14 men, around 630 names. Some people have asked me how the Absent Voters' List can help us identify the men who fell in the war as of course it lists living men. The list was compiled in the period winter 1917/1918 when names were collected from families in Barnsley who had men (and 4 women) who would have been eligible to vote in the forthcoming December 1918 election. As the war still had nearly a year to run a number of the men recorded were subsequently discharged through injury, wounds or sickness (there is one in the snip above) or were killed in action or are simply recorded as dead - which may mean they died out of service, or possibly in service, just not killed in action - more checking needed again. The discharge of a man might indicate wounds or war related sickness which later caused their death AND if they died before 31 August 1921 they would have been eligible for a Commonwealth War Graves Commission (CWGC) entry ... so each of these names might indicate a casualty too. I have had time to look more closely at some of the men I identified last week. 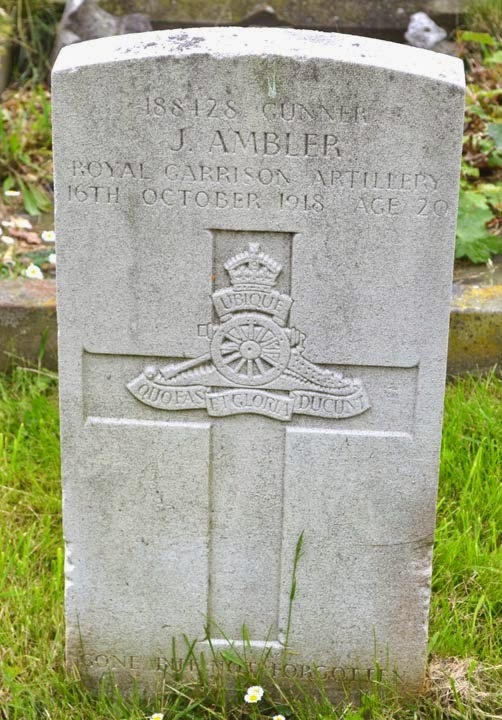 One of the men noted as 'Dead" was Joseph Ambler, 188428, Royal Garrison Artillery. He is buried in Barnsley Cemetery with a CWGC gravestone and listed on Soldiers Died in the Great War (SDGW) on Ancestry as 'Died of Wounds'. He is remembered on the Oak Plaque at St Peter's Church on Doncaster Road, Barnsley. The second man indicated as 'Dead' in my first week of research was John Henry Carr, an Airman in the Royal Air Force. He appears to have died after his transfer to the reserve in 1919 - there is a note on his RAF records on Find My Past which appears to read deceased (or possibly discharged dead?) on 30 July 1920 (see above). However I can find no evidence showing him buried in Barnsley or even a death index entry on FreeBMD for a John Henry or a John H Carr in 1919 or 1920 - there are several John Carr entries, but none the right age or in Barnsley. So he's a mystery! One of men noted as 'Killed' was John Henry Carr's son Richard, 142754, Machine Gun Corps. His SDGW entry states that he was killed in action on 29 April 1918, and the CWGC notes that he is remembered on the Tyne Cot memorial. He does not appear to be remembered on any Barnsley war memorial that has been recorded so far. The family was from Hunslet, near Leeds, so there is the possibility he is remembered in that area. He was baptised at St Jude's, Hunslet in 1900 (available on Ancestry), unfortunately a Google search shows that this church closed in the 1950s and has been demolished. The final 'Killed' entry on my first week of transcription was Samuel Musgrave, 40472, Leicestershire Regiment. He was killed in action on 15 August 1918 and is remembered on the war memorial plaque in St Peter's too. I also checked the 'Missing' and 'Discharged' men for CWGC entries. There was only one, Frederick Bassett, 44565, Lincolnshire Regiment, killed in action on 17 April 1918. He is not remembered on any Barnsley memorial but his CWGC entry notes that his name on the Tyne Cot memorial. It also tells us that his father, another Frederick Bassett, lived at 22 Grasmere Road, Barnsley, which agrees with the entry on the Absent Voters' List. So my grand total for just one week's work is two men from Barnsley not remembered on a memorial, two who had already been recorded because they are on a memorial and one more who might be eligible for an entry if we can work out where, when and how he died. I know the this seems like a lot of work for very little return - but how else would we have discovered that Richard Carr was from Barnsley? He does not appear to be mentioned in the Barnsley Chronicle and his CWGC entry has no additional information to help identify him. We do need to use every resource we can find to track down these fallen men ... and corroboration of facts we already have is not a waste of time - it does prove that our first identification of the men was correct.